While much mystery still surrounds Hitman and just exactly what we’ll get at launch on March 11th, this new trailer makes it clear what kind of ambition we’re in for. Hitman has always prided itself on large areas, but Sapienza is no big arena: it’s a whole town. And that means plenty of opportunities for sneaky murders. Looking to shoot someone right now? Then you need to play one of the best shooters on PC. Sapienza looks huge, with numerous back alleys, rooftops, and tourist spots to be turned into sniper nests. Rather than looking like a sizable contained map, it appears to be much more natural, with a genuine atmosphere of relaxed european coastal resort. This is the exact evolution we wanted from Blood Money’s huge arenas. Absolution may have been a misstep on the way, but it looks like we’re finally getting there. The seren video shows off a few kills, with Agent 47 donning costumes, drawing knives, and aiming sniper rifles in his quest to complete his contract. Hopefully soon we’ll be provided with information on just what kind of murder possibilities will be available to us. 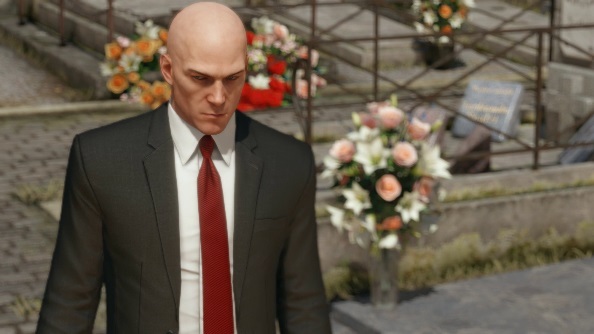 Hitman releases in episodic-but-not form on March 11th.